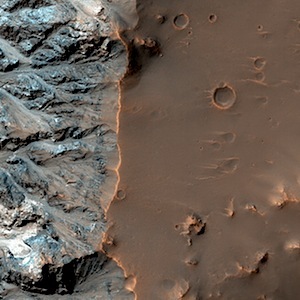 Clays exposed by an impact in Tyrrhena Terra — Tyrrhena Terra is south of the Martian equator and immediately northeast of the giant Hellas basin. This entry was posted in Reports and tagged Beautiful Mars, clays, Hellas Basin, High Resolution Imaging Science Experiment, HiRISE, Mars Reconnaissance Orbiter, MRO, NASA, phyllosilicates, Tyrrhena Terra, University of Arizona. Bookmark the permalink.